In preparing to invest into a backyard living environment, an In-ground Swimming Pool and or Spa can be a key element for consideration, in that of providing a strong return on your real estate investment! If you are looking to purchase a new or remodeled swimming pool, spa and or possible landscaping, it is very important in today’s very competitive world to become a little more familiar with how to compare. We have provided you with a “Sample Estimate Form” on this webpage, in order to allow you to familiarize yourselves with how our quotation / proposal will appear. We also have provided you with images of some of the equipment being considered. “click” upon an image, to enlarge, “click” again to return to this page. In order to better serve your investment dollar’s greatest potential…we have prepared a “checklist” form on this page below, in which our prospective Clients might take a few moments to entertain the many possibilities of further expression for the requirements. Some of the items listed below may likely be more technical in nature than you may be familiar with but, in engaging the opportunity for discussion, we believe it provides us both an opportunity to better formulate a more accurate and thorough quotation response. “click” upon the plan, to enlarge, “click” again to return to this page. 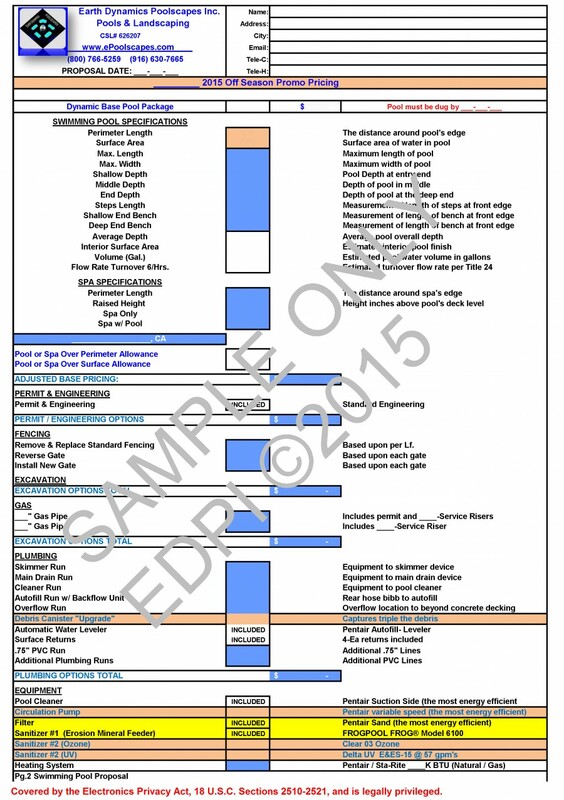 By connecting your specifications to a “Detailed Plan” you can be assured that both the desired elements and the standards will become obligatory to the installation performance of each specific trade. Additionally, we will need a copy of your property’s Plot Plan in order to review any applicable building restrictions, i.e. 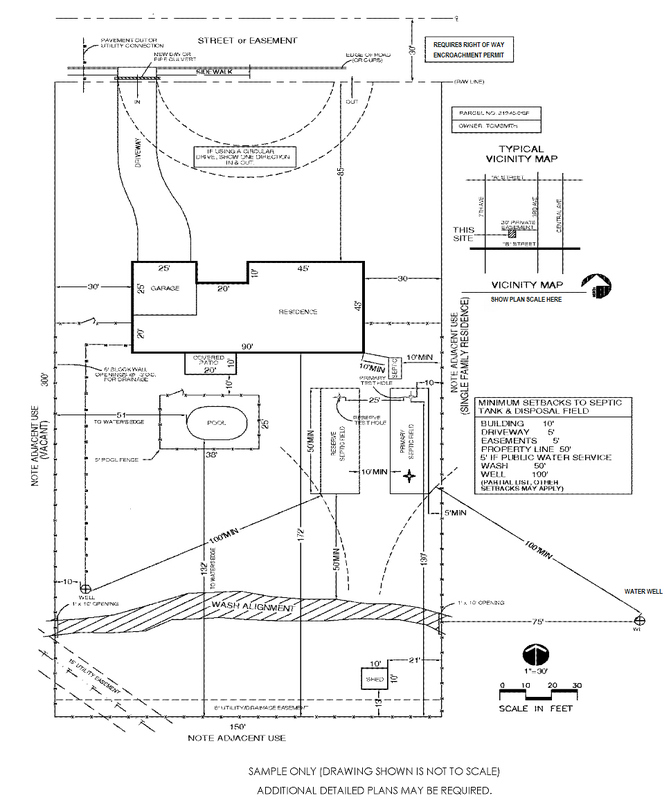 ; Building Set-Backs (SB), Public Utility Easements (PUE), Equipment Set-Backs, etc..Click HERE to view a sample of the information we are looking for on your Plot Plan. ITEM NOTE: Most all Mfg's will produce Pumps, Filters, Heaters, Sanitizers, Automation, Lighting, Waterfalls, Deck Jets, Bubblers. The difference (from our perspective) is the warranty support and as a Builder / Designer our first choice is Pentair. They provide a 3-Year "Bumper to Bumper" warranty that is supported by a host of Factory Trained and Certified Technicians throughout the US. ITEM NOTE: Filtration of the pool / spa water causes hydraulic head loss (restriction) to the pump's water flow. Therefore excessive flow restriction costs more to operate per kWh. 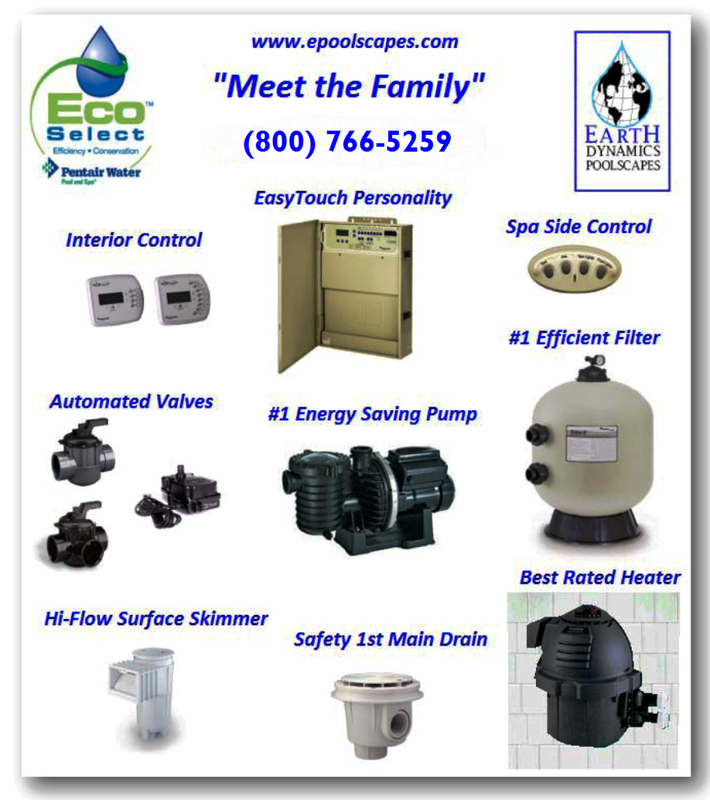 Sand filtration offers 50% greater flow saving $455.00 / Yr. (avg.) in electrical energy and additionally saves $400 to $600 dollars every two years on cartridge replacements, as recommended by the Mfg. ITEM NOTE: Spas come in several sizes and shapes. Additionally, many other options are available, depending upon your desires. Raised Edge, Spillway, Seating Depth, Swim-Up Bar, etc..Please use the "Text Box" below to expand upon your explanation regarding your desires. ITEM NOTE: Spas can be a simple hot water environment or as elaborate as a therapeutic message experience. The type of jets, the delivery of the air flow, the delivery of the hot water and other considerations will define the differences between what is deemed Industry Standards, verses Custom Standards. ITEM NOTE: There are different styles of pool cleaner devices. The "a" selection above is the most energy efficient and has an "optional" deck side Debris Canister available, that works in conjunction with the Suction Side Cleaner. This combination is not only the most efficient but, it also provides a much greater capacity for the collection of bottom debris. ITEM NOTE: The preparations for swimming pool sanitation is a key element to "grief free" maintenance! The healthiest technologies, are the combined the use of Ozone, U.V. and an Erosion Feeder to supplement bacteria growth during warm weather conditions. ITEM NOTE: Gas piping is run from the LPG tank or the Gas Meter to the Pool Equipment Pad. The distance allows us to determine the pipe size that will be required. Please provide us with an estimated distance for costs estimating. ITEM NOTE: In-Deck Solar Radiant Heating is the most energy efficient and thermal conductive. A typical installation is installed in the pool concrete decking that has a sufficient SF area in ratio to the pool's water surface. Water tubes are manifolded into a grid network which absorbs the heat from the concrete that is exposed to a direct SW sun light exposure. The Solar operation can be run at off-peak hours (night time) providing a fraction of the cost for pumping energy as compared to roof solar. ITEM NOTE: Automation Systems range in "relay circuits" capacity sizes in order to provide individualized functional control for each device, i.e. Spa Pump, Heater, Light, Air Blower, Landscape Lights, etc...The size or capacity is determined by the amount of individual operational control being desired. If a Spa was to incorporate, (1) LED Light, (1) Booster Jet Pump, and (1) Heater, then (3) three additional "relay circuits" would be needed for the Spa. The Filtration Pump doesn't require a relay but, Pool Light (s) and other possible Auxiliary Pumps (Water features) will need additional relays if it is desired to have individual operational control. 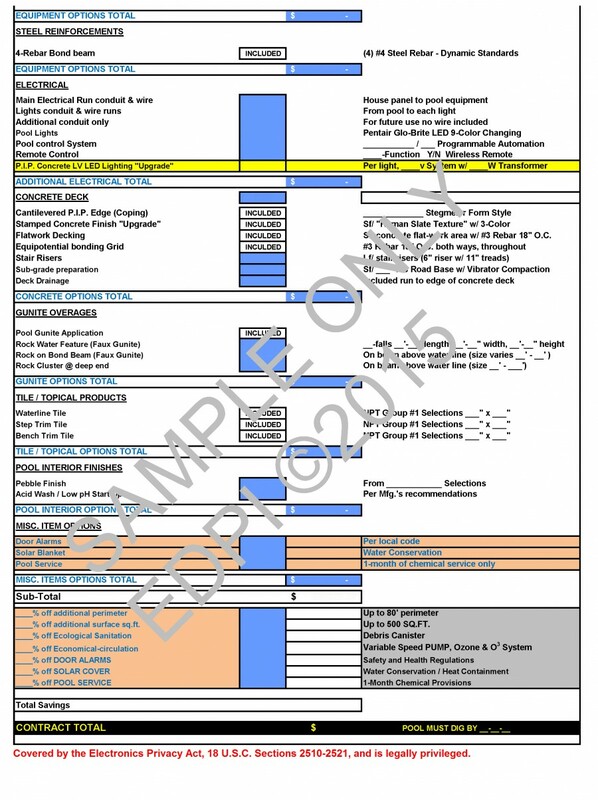 ITEM NOTE: The Main Electric Meter's supply will be rated in ampere capacity, and this is generally indicated on the large "main" breaker lettered in white as, 100, 125, 200, etc...There will be an assortment of other smaller breakers that distribute electrical power throughout the home but, the main size is the information we are looking for in this item. ITEM NOTE: The distance from the Main Electrical Supply "Electrical Meter" to the Pool Equipment Pad is an important measurement, as this distance and combined ampere load will dictate the size of the electrical conductor (wire size). The National Electrical Code (NEC) stipulates that the Allowable Voltage Loss (AVL) may not exceed 3% of the line voltage over the length of this run. So...accounting for all equipment and secondary 120v power distribution (Landscape Lighting, BBQ - GFCI) that will be fed from the Pool Equipment's Sub-Panel is very important in providing for the complete power needs. ITEM NOTE: BBQ Cook Centers have several sizes and options, and depending upon the home's utility's connection (s) availability, some may not be possible i.e. sewer to sink. ITEM NOTE: The Pool and or Spa will require engineering and any independent masonry site walls that are higher than 3'-0" will also require engineering in order to obtain a Building Permit. In some cases a pool's shell can be elevated in order to accommodate a higher elevation, which is called a "Raised Bond Beam". 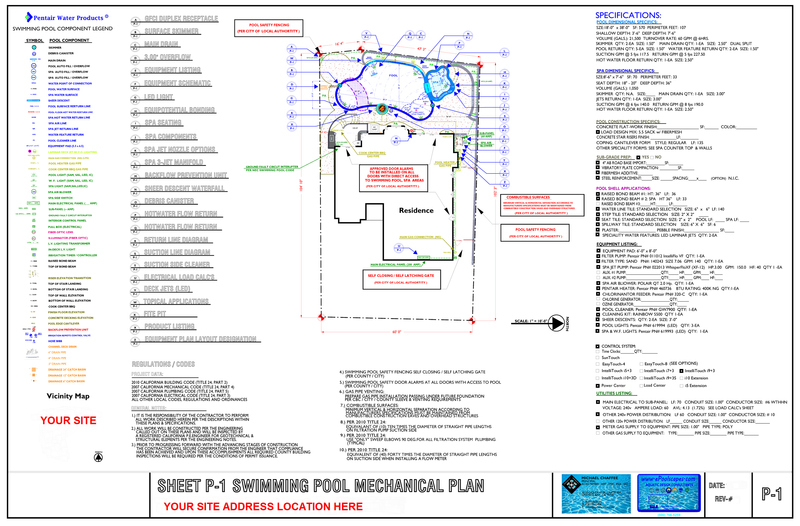 This can be made part of the pool's engineering and shown on the Steel Schedule. ITEM NOTE: Concrete applications can involve several considerations. Preparing for the sub-grade by importing AB Rock and compacting it...together with load design additive considerations i.e. ; concrete color, fiber-mesh, 6-sack mix, steel reinforcements and other integrity building elements will add cost per square foot. Please use the Text Box below to provide us with approximate SF areas and any information that can aid our understanding for your desires.